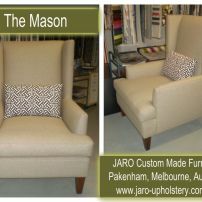 commented on "The Mason Modern Winged Arm Chair by JARO Upholstery, Melbourne"
JARO's Mason Arm Chair. The Mason is upholstered in a lovely soft woollen fabric complimented with a feather filled seat cushion & scatter. 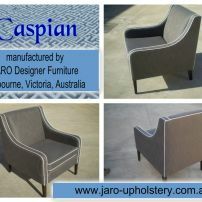 commented on "The Caspian Modern Arm Chair custom made by JARO Upholstery, Pakenham, Melbourne"
Available in a large selection of fabrics and leathers. Can be custom made in a size to suit you. 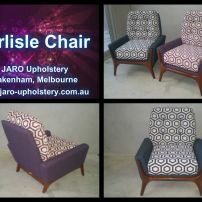 Contact Jason and Robyn to make a time to design your special chair on 0402 188238 or email jaro.upholstery@live.com.au. 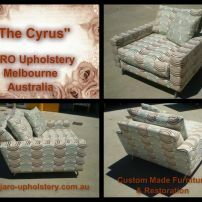 commented on "The Cyrus Arm Chair by JARO Upholstery, Melbourne"
Available in leather, vinyl or plain, textured or patterned fabric. The metal base can also be swapped for numerous different leg styles. 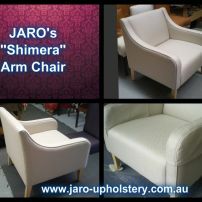 commented on "Carlisle Arm Chair by JARO Upholstery, Pakenham, Melbourne"
Available in leather, vinyl or plain, textured or patterned fabric. 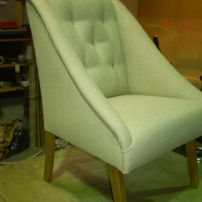 The wood base can also be swapped for either a metal or wood Danish styled leg. 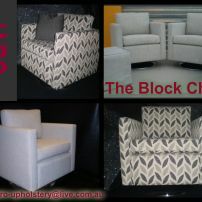 commented on "The Block Chair by JARO Upholstery, Pakenham, Melbourne"
JARO custom makes this chair in a large range of colours and patterns. The Block Chair is extremely comfortable and looks fantastic in any room. commented on "JARO's Shimera Modern Boutique Arm Chair"
A large modern comfortable chair that makes a statement in any room! 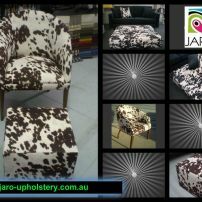 commented on "JARO's Cowhide Print Furniture, Sofas, Chairs, Ottomans, Scatters now available in Melbourne"
commented on "JARO's Fia Modern Arm Chair - Available in Pakenham, Melbourne and Mornington Peninsula areas. $440"